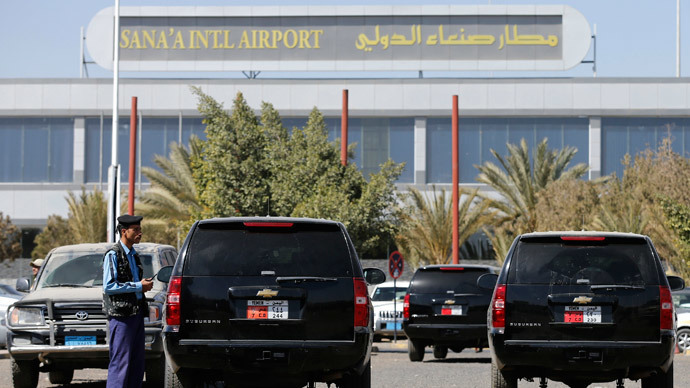 A state-chartered Russian plane destined for the Yemeni capital Sanaa had been diverted to Cairo, after the Saudi-led coalition reportedly refused it landing permission, leaving scores of Russian expats awaiting evacuation to languish at the airport. Shayef said that Russian citizens – mostly oil industry employees and their families – had gathered in the airport in anticipation of the flight. Mayadeen, which broadcasts all over the Arab world, claimed that the refusal was in contravention of earlier promises made by the coalition to Moscow, though Russian diplomats in Cairo stopped short of blaming Saudi Arabia. Last week, five Gulf states, Egypt, Pakistan, Morocco and several other Sunni Muslim countries launched a series of airstrikes against the Shia Houthi rebels, who had gained control of the capital and large swathes of territory in the west of the country. Neighboring Saudi Arabia, has taken full control of the country’s air and sea ports, purportedly to prevent the inflow of weapons from abroad. Riyadh has openly accused its regional arch-rival Iran of funding the rebels, and fomenting unrest in the country of 25 million people.